Church - Joseph Smith Jr. When God answered Joseph’s prayer about which church he should join, he was instructed to join none of them. In truth, what God and the Lord knew but which Joseph did not yet understand was that “The Church” was synonymous with “The Believers” as stated in D&C 10:67. Why did Joseph start a church if it wasn’t part of his call? Luckily we are not left to guess, but have the first hand account of one of Joseph’s closest associates – David Whitmer. David was one of eight children, and became one of the Three special Book of Mormon Witnesses to see the angel and the record. Later in life David produced a booklet entitled An Address to All Believers in Christ, dated 1887. It is widely circulated, but not within the Mormon Church. In it, David describes why Joseph started a church, and why it grew into something unlike the church of The Book of Mormon. It was actually Joseph’s scribe Oliver Cowdery who received the mandate to start a church and he even wrote up the articles for it in The Articles of the Church of Christ by Oliver Cowdery. Everything the Articles contain come from The Book of Mormon. It details how to perform baptisms, communion and ordination; with specific verbage and methodology; plus the manner and timing of church meetings; church offices being made up of elders, priests, and teachers. The instructions were simple and in harmony with the New Testament church. Not long after this, a man with an established congregation came to Joseph and inticed him to come and join their group as its leader. This was Sydney Rigdon, a Restorationist preacher. 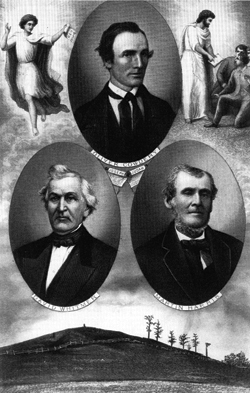 It was from him that Joseph learned about the Restoration framework; and by whom they added a priesthood hierarchy. We now know why Joseph started his church, and we know why it grew into the Old Testament priesthood framework. This was however not part of the work God called him to, and that type of church was not supported by The Book of Mormon. In the end, all surviving Book of Mormon witnesses left Joseph Smith and his church, but none of them ever recounted their testimony of The Book. Joseph did his part in bringing forth The Book of Mormon, but it was not his part to sequester The Book to a church. All denominations were meant to embrace The Book of Mormon as the Second Witness of Jesus Christ. But because Joseph tied it to his church, it has forever been wrongly associated with the doctrine of his church. Polygamy as a requirement for exaltation. Temple endowment as a requirement for exaltation. Word of Wisdom as a requirement for exaltation. Washings, anointings, garment wearing, etc. as requirements for exaltation. Eternal marriage/sealing as a requirements for exaltation. One true church – the Mormon Church, all others are wrong. God will only work through a Mormon prophet. None of these doctrines are found in The Book of Mormon, therefore none of them should be associated with it.